The Trinidad and Tobago Women’s National Senior Team suffered another heavy defeat last night, as they went down 6-0 to the United States at an exhibition match in San Antonio. Photo: United States player Stephanie McCaffrey (right) goes for goal under pressure from Trinidad and Tobago defender Danielle Blair in international friendly action on Thursday December 10. The result was hot on the heels of an 11-0 hammering from Brazil for a largely second string Trinidad and Tobago team in Natal, although the “Women Soca Warriors” might have gone in level at halftime last night but for a horrendous refereeing decision. In the end, though, United States captain Carli Lloyd’s controversial penalty kick was just a footnote in the affair as the hosts scored five second half goals to complete a comprehensive win for the 2015 FIFA World Cup champions. It should have been a moment to savour for the women’s programme, as the Trinidad and Tobago players matched themselves against FIFA’s number one team in front of a sold out arena and a television audience in the millions. Instead, the Women Warriors pondered skipping the game altogether, due to a lack of detail over the financial incentives for their appearance. 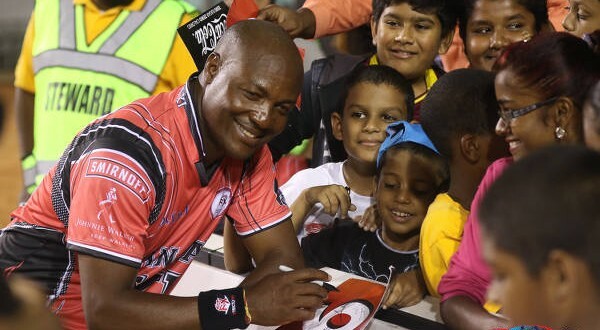 Remarkably, according to an informed source, the players held a dinner meeting last night to discuss unpaid stipends and the Trinidad and Tobago Football Association’s failure to offer them a slice of the television revenue for a game that was broadcast live on ESPN. 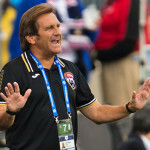 It is unclear what the specifics of the agreement between the United States Soccer Federation (USSF) and the TTFA were since, as was the case throughout the reign of former president Raymond Tim Kee and general secretary Sheldon Phillips, the match contract was not even shared with the local football body’s executive committee. 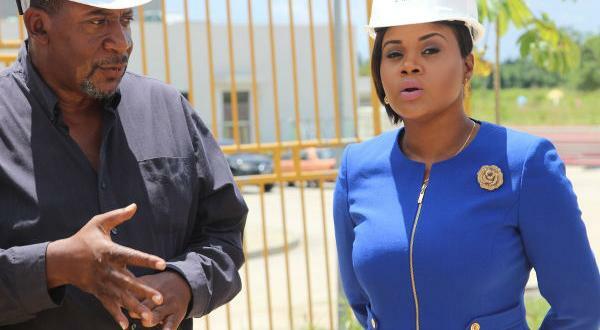 It meant that, for the second time in 24 hours, new TTFA president David John-Williams was faced with the prospect of an embarrassing strike. As it stands, Williams will hold an emergency executive meeting with his vice-presidents today to search for a solution to the men’s senior team’s threatened mass boycott of next month’s Copa América Centenario Play Off against Haiti in Panama. It is unclear whether the Women Warriors issues were ever shared with the TTFA president or quietly quelled within their own team meeting. 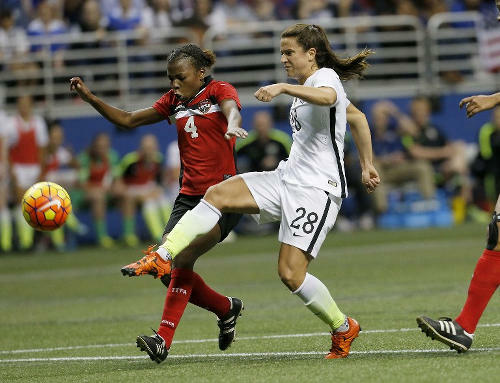 But the lack of financial support for Trinidad and Tobago’s women footballers was a constant theme of the match yesterday by ESPN analyst and former US international star, Julie Foudy. 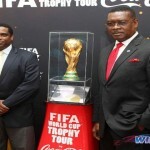 Williams must have known he faced a tough job in the TTFA hot seat. But he could not have expected such a baptism of fire. 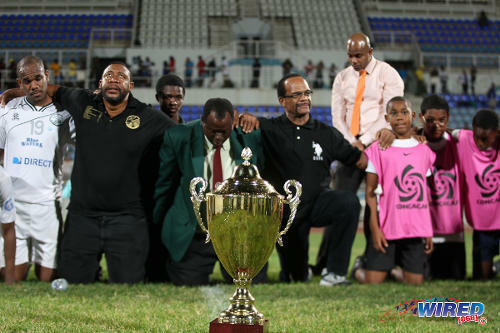 Photo: Former W Connection president David John Williams (second from left), coach Stuart Charles-Fevrier (centre) and defender Joel Russell (far left) say a prayer of thanks after securing the 2013/14 Pro League trophy at the Ato Boldon Stadium in Couva. The Women Warriors suffered a tough start themselves last night as they lost defender Lauryn Hutchinson to injury and then conceded a disgraceful and controversial opening item in the 21st minute. 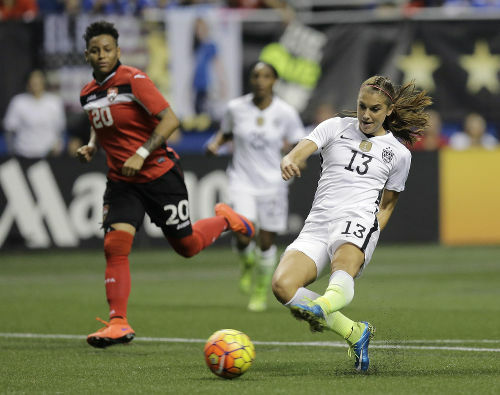 US striker Alex Morgan led with her studs in a vain attempt to reach a long ball over the top and planted her boot in Trinidad and Tobago goalkeeper Kimika Forbes’ midriff. Bizarrely, the referee gave a penalty to the hosts and Lloyd made no mistake from the spot. There were no more goals in the first half and, although Forbes made a superb save to push a Crystal Dunn effort on to the bar, the World Cup champions were largely restricted to half chances. But the “Yanks” were persistent. Lloyd’s ladies played at a high tempo, moved the ball quickly and were never shy to take the direct route to the opposing goal. 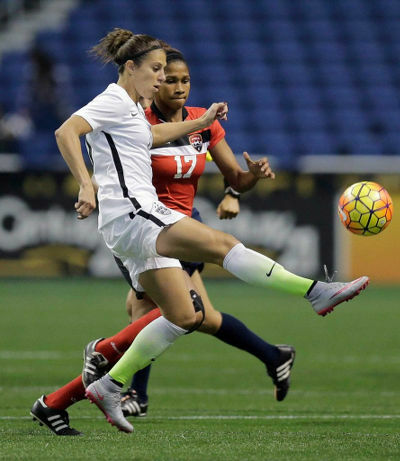 Photo: United States striker Alex Morgan (right) goes for goal while Trinidad and Tobago defender Lauryn Hutchinson looks on during international friendly action in San Antonio on Thursday December 10. Waldrum had less than a week to prepare his squad to tackle the world’s best football nation while his most lethal attacker, Kennya “Yaya” Cordner, had not played competitive football in roughly five months. Perhaps predictably, the Women Warriors just could not hold on to the ball and their opponents were credited with almost 80 percent possession at one stage. 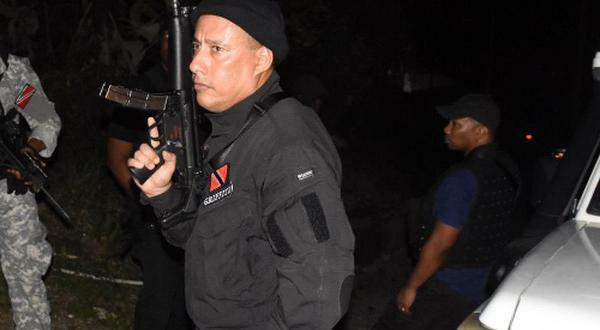 Inevitably, the Trinidad and Tobago backline would succumb to the relentless pressure. In the 51st minute, Paris Saint-Germain (PSG) midfielder Lindsey Horan freed Morgan with another incisive long ball and, on this occasion, the striker did the business without maiming Forbes. Ten minutes later, US attacker Christen Press made it 3-0 with a left footed strike from the edge of the area that Forbes should have done better with. The talented Trinidad and Tobago goalkeeper atoned somewhat with a fine save to deny Press in the 66th minute. But the hosts had already smelt blood. Press got the US’ fourth goal in the 74th minute with a shot from inside the penalty area that deflected off stand-in T&T captain and defender Arin King and flew through Forbes’ legs. And the attacker completed her hattrick in the 83rd minute with a free header from a Horan cross that gave substitute Trinidad and Tobago custodian Saundra Baron no chance. 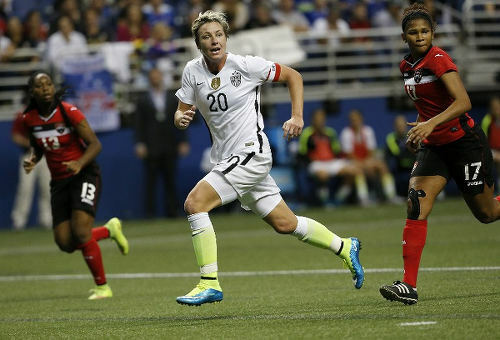 Photo: Trinidad and Tobago defender Victoria Swift (right) tries to close down a United States player during international friendly action on Thursday December 10. There was still time for a parting shot, one minute into stoppage time, as the impressive Horan converted from close range to round off the score summary at 6-0. At the final whistle, Trinidad and Tobago had not tested United States goalkeeper Hope Solo once. But, thankfully, it never looked like getting close to double figures and, considering the team’s inadequate preparation and disenchantment over match fees, Trinidad and Tobago football fans have little choice but to lower their expectations. The Women Warriors fly to Brazil today in preparation for Sunday’s assignment against Canada in the Natal Female International Tournament. It is uncertain whether coach Randy Waldrum, his assistant and son Ben Waldrum and current captain Arin King were able to get their visas in time. 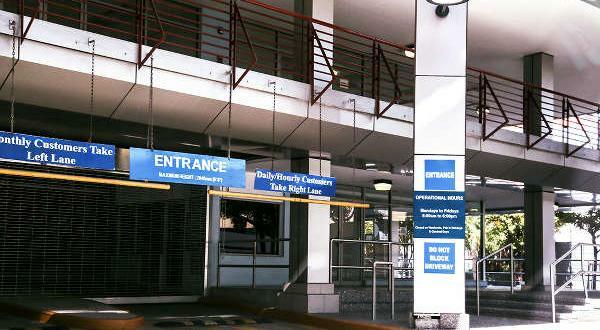 While there is every chance that the issue of financial compensation will be raised again before too long. 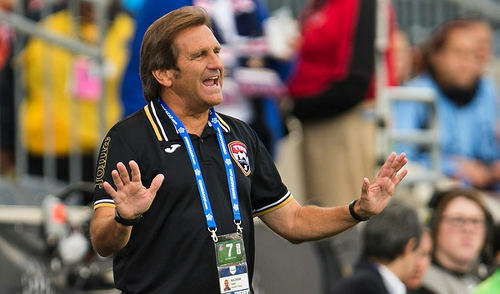 Photo: Trinidad and Tobago Women’s National Senior Team coach Randy Waldrum. Williams was credited for wooing former captain Maylee Attin-Johnson back into the national team set-up for the Natal four-nation competition. But he is not thought to have formally addressed the players’ representative for the men’s or women’s senior national teams. In light of the rumblings over the past 24 hours, it might go down as his first serious miscalculation. Trinidad and Tobago: Kimika Forbes (GK) (Saundra Baron 76), Danielle Blair, Arin King, Brianna Ryce, Victoria Swift, Lauryn Hutchinson (Patrice Superville [Tia Walcott 64]), Khadidra Debesette (Janice Johnson 81), Janine Francois (Mariah Shade 71), Tasha St. Louis, Ahkeela Mollon, Kennya Cordner. I really wouldn’t be surprised if they read about the men’s situation, started murmuring among themselves about what they should and shouldn’t do and then just decided to get on the field. I think it is generous to say they were there physically yes. Not to be mean. But because they simply don’t have the desired fitness at the moment. Sorry, I was not referring to their physical fitness or ability in that instance, but simply their presence being on the field. It’s very clear that those players were there physically, not mentally. Well, it will be clear to those who actually follow women’s football and not to the ones who just read headlines and comment!!!! I took all of the circumstances into consideration, but I saw way too many instances of just trotting on the field with no purpose, making a lot of bad passes (sometimes out of bounds) with no pressure etc. My expectations were not high, but I just didn’t see a concerted effort. I think part of that might be down to fitness. Our play on the ball was really weak. I think our backline did very well to resist USA for so long in the circumstances. It was relentless pressure. These are the kind of performances that make fans stop showing up for home games. No…these are not the kind of performances that make fans stop showing up. Fans stop showing u because they are “Fans”, “supporters” will show up regardless of the score!!!! Apart from Kimika Forbes, no on else showed up. This team is unrecognizable (not talking about personnel) from the one that played last year. It’s sad to see our far backwards our women have gone due to being inactive. Kinda reminds me of our post 2006 for our men’s team. Instead of building on laudable performances, we did the opposite. We can only hope that going forward, the team is not ignored again in the same manner.